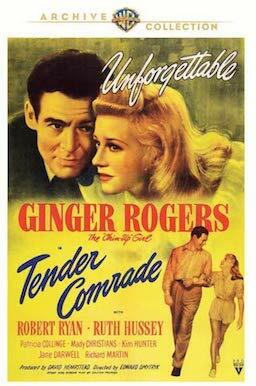 Ginger Rogers stars in Tender Comrade, a World War II drama about a group of housewives who bond together while their husbands are off fighting. These “war widows” pool their salaries, move out of their single apartments, and find a house where they can live comfortably while waiting for their husbands to return. By day they work at the war factory, and by night they maintain as normal a life as they can. Rogers is Jo, the self-proclaimed leader of their little democracy. During the film there are flashbacks with Jo and her husband Chris (Robert Ryan) that fills in the history of their lives and her personality. She is always peppy and upbeat and often says things that she probably shouldn’t. But that’s Jo. She’s loyal and friendly, and has a good head on her shoulders. Rogers is amazing in this film. She doesn’t dance or sing. She just acts, and her acting is top notch. She was not nominated for an award for her performance in this film, however she should have been. She gives an unforgettable performance. The women keep up their morale as the days go by and the news from overseas gets grim. But they are hopeful their lives will soon return to normal and their husbands will once again be home. This 1943 film (in black and white) caused a stir for the House Un-American Activities Committee. First, it was written by Dalton Trumbo (a blacklisted writer) and directed by Edward Dmytryk, one of the Hollywood Ten who was arrested by the House Un-American Activities Committee. Tender Comrade is a sensitive drama portrayed in a sympathetic way by all the actors: Ruth Hussey, Patricia Collinge, Mady Christians, and Kim Hunter. Pop this DVD into your player and grab some tissues! Tender Comrade is part of the Warner Archive Collection and can be purchased from their website or online retailers where DVDs and Blu-rays are sold.